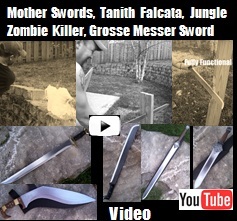 Grosse Messer Hunting Sword. Fully Functional. Made by Scorpion Swords & Knives from Quality Heat Treated Steel. See Pictures, Prices, and Descriptions. Handle Length = 6 ” Handle Width = 1 3/8 “ Handle: Brass & Black Linen Micarta. Known throughout Germany as the "Big Knife", the Grosse Messer hails from central and northern Europe where, in far off days of old, noblemen and peasants alike relied on it to protect herd and home from the ravages of brigands, cut throats, outlaws and outlaws.